Aim and Objective: To develop efficient method for the synthesis of unusual oxetanes bicycle and diversely functionalized oxetane motifs bearing medicinally relevant functional group in new chemical space and evaluation as cytotoxic agents. Materials and Methods: General procedure for the synthesis of 2, 3, 9 and 11: A mixture of L-ascorbic acid derivative 1 or 8 or 10 (10 mmol) and benzophenone (12 mmol) in dry benzene (125 mL) was purged with dry nitrogen for 5 min. The solution was then irradiated for 20-24 h with UV light (125 W, medium-pressure mercury lamp) in an immersion-well photoreactor at ambient temperature under nitrogen. After completion of the reaction, the solution was washed with aqueous NaHCO3 (10%), dried (Na2SO4), and concentrated under reduced pressure to give crude product which was purified by column chromatography using ethyl acetate: n-hexane (5-20%) as eluent to yield pure product as white solid. Results: 3-O and 2-O methyl derivatives of 5,6-O-isopropylidene-L-ascorbic acid 8 and 10 were irradiated with Benzophenone to give single regioisomer 9 and 11 in 78 % and 69 % yield respectively, while in case of 5,6-O-isopropylidene-2,3-di-O-methyl-L-ascorbic acid, it gave both regioisomer 2 and 3. The presence of only oxetanes moiety improved the cytotoxic activity compared to oxetanes bicycle moiety. It was scrutinized that all the compounds in series of 2 and 4 displayed more MCF-7 cell proliferation than their regioisomers 3 and 6. 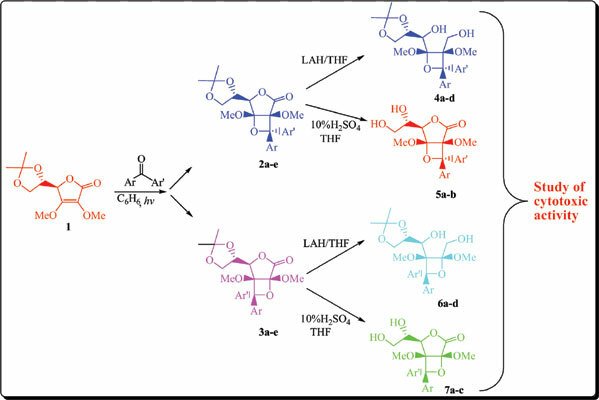 Conclusion: We have developed a versatile strategy to prepare diversely functionalized fused oxetane bicycles involving alkoxy, hydroxy methyl, alkyl, and aryl substituents. A wide variety of functional groups have been introduced on the oxetane ring, accessing new chemical space. These compounds were tested for growth inhibition against MCF-7 breast cancer cell line, compounds 2d, 4b, 4d and 6d showed comparable cytotoxic activity with L-ascorbic acid. These oxetane motifs will provide interesting new structural elements for medicinal chemistry programs as well as synthesis. L-Ascorbic acid, carbohydrates, cycloadditions, Paternò-Büchi reaction, oxetane, cytotoxicity.